Background: Peripheral blood stem cells (PBSC) have become a widely applied therapeutic option in hematological, immunological diseses.Simplified methods for PBSC cryopreservation and storage are needed. Objectives: To select an alternative cryopreservation protocols of (PBSC) to reduce the cost, time and enhance the safety and effectiveness of these cryopreservation methods. Subjects Methods: The current study was the first Iraqi study in this field, conducted at BMT (Bone Marrow transplantation) center in Baghdad Iraq, on nine healthy male donors, median age 34.8 years (range 21-46 years). The plan of the study was as follow: Mobilization of peripheral blood stem cells (PBSC) with G-CSF, Collection of PBSC (leukapheresis) was done using a blood cell separator (Haemonatics MCS +) Processing of PBSC& mixing with the following different cryopreservative solutions: (Sol 1): 10% DMSO (dimathylsulfoxide) + autologous plasma (Sol 2): 10% DMSO + autologous plasma + Hank's solution. (Sol3):5%DMSO+Autologousplasma+phosphate buffer saline. Then Cryopreservation in 3 different methods: (Freeze- A): controlled rate freezing (CRF) & stored in liquid nitrogen -196 °C. (Freeze - B): liquid nitrogen (LN2) -196 °C. (Freeze -C): blood bank (B.B) mechanical freezer at -60 °C. All samples were stored for one month. Viability test for PBSC using Try pan blue stain was conducted on each different sample after thawing at day 1, 3, 7&30. Results : Comparing the results obtained from the three different types of solutions 1, 2, 3 &the three types freezing A, B, & C, the following points were observed: Using Sol 1, Sol 2& Sol 3 ,the survival rate of PBSC in Sol 1,2,3 all values showed statistically significant differences between days 1,3,7&30 with P value <0.05 in the three freezing methods .The best results were found in CRF ,then LN2 & the lowest in blood bank freezer ,by using Sol 1&Sol 3,while using Sol 2,results of CRF was equal to LN2&both were higher than blood bank freezer. All the three methods of freezing can be applied safely for cryopreservation of PBSC. Conclusion : In the cryopreservation method of blood bank mechanical freezer applying Sol 3 is an alternative method which has lower percent of DMSO =5% and therefore lower toxicity effects with effective results regarding viability of PBSC. We can use Sol 2 instead of Sol 1 to have the same effective results of cryopreservation in liquid nitrogen equal to that of controlled rate freezing. So we can obtain high results of viability in PBSC by simpler, cheaper and less time consuming method of cryopreservation. Background: Consolidation chemotherapy is an important concern in maintaining remission in acute myeloid leukemia (AML) . Objectives: We intended to evaluate the efficacy of using modified MidAC regimen in the therapy of adult AML patients . Patients & Methods :Twenty-six patients (mean age, 25 years; range, 17 to 45 years) with de novo AML were given induction regimen according to the AML subtype .Patients who failed induction, were received modified MidAC as salvage therapy .All patients who achieved complete remission (CR) were assigned to receive 3 successive courses of modified MidAC as a consolidation treatment . Results :A total of 21 (80%) patients went into CR after one induction regimen .In the rest 5 (20%), 3 (60 )%of them enter CR after re-induction with modified MidAC, and 2 (40 )%died .Total 24 patients assigned for consolidation therapy .After completing the 3 consolidation courses, 21 (88 )%of them were maintained in remission while 3 (12 %)died .The median duration of follow up was 11.7 months .At the end of the study, 13 patients) 54 )%were in CR and 8 (38 )%relapsed .The median overall survival) OS )is 20 months and the 2 years OS is 41.%Median disease-free survival (DFS )is 17 months and the 2 years DFS is 37 .%Median survival after relapse was 2.5 months .Main toxicities after modified MidAC regimen were myelosuppression, GIT complications and sepsis .Conclusion :Modified MidAC regimen is an option as a consolidation or as a salvage therapy in the treatment of adult AML patients with minimal difference in the rate of toxicity when compared with other high-dose regimens . Background: Hodgkin disease (HD) is a histologically defined B- cell neoplasm and it includes two distinct types of disease, classical and nodular lymphocyte-predominant Hodgkin's disease. Disruption of the physiological balance between cell proliferation and apoptosis is a universal feature of all cancers. Apoptosis is caused by activation of the caspases through extrinsic and intrinsic pathways. Extrinsic pathway centers on TNF family, where the ligand will bind to the cell surface receptor to induce apoptosis. Fas receptor is a member of the TNF receptor superfamily. Fas family is constituted of the receptor, ligand and soluble form. Soluble Fas will interfere with apoptosis by competing with Fas receptor for binding to legend. The aim of this study is to measure the concentration of serum soluble Fas in Hodgkin's disease patients and to determine the relation between it and certain clinical parameters and serum markers. Also to compare the concentration of serum sFas in HD and Non-Hodgkin's lymphoma (NHL) patients. Patients & Methods: This study included 15 patients with Hodgkin's disease, 9 males and 6 females. The patients were interviewed for history and clinical examination and blood was collected for measurement of serum sFas concentration using ELISA technique. Hemoglobin (Hb) concentration, leucocytes and platelets counts, peripheral blood smear, C-reactive protein (CRP) and lactate dehydrogenase (LDH) level were all performed using standard techniques. Results: This study revealed that the serum soluble Fas concentration was almost the same (p-value = 0.991) in both HD patients (1996.9 ± 131) and normal controls (1993 ± 125.9). However, by comparing the results of this study with the high concentration results obtained for serum sFas in newly diagnosed NHL patients (6475.9 ± 617) of another study, it revealed a highly significant difference (p-value < 0.0001) between the two groups. Conclusions: The serum Fas concentration differs significantly between HD and NHL patients but not with control patients. Further studies including larger number of patients are recommended. Background: Hypochromic microcytic anemia is the most common encountered type of anemia and it includes several types, iron deficiency and β-thalassemia trait are the commonest examples, and since the definite diagnostic tests are not always available, therefore, the maximum utilization of the cell count autoanalysers for screening testing and reducing the number of patients who needs the use of more specialized techniques can be useful. Objectives: To evaluate the results of hematology autoanalyser in iron deficiency anemia and β- thalassemia trait. Patients & Methods: This is a cohort prospective study in which two hundred newly diagnosed patients with hypochromic anemia, and proved later to be either iron deficiency anemia alone or β-thalassemia trait alone are included. These patients were attending the National Center for Hematology from January 2009 to February 2010. Results: There is a highly significant difference in red cell count, hemoglobin concentration and hematocrit percent (p-value < 0.001, 0.003 and < 0.001 respectively) between iron deficiency anemia and β-thalassemia trait. A highly significant relation is found between hemoglobin concentration and other red cell parameters and white blood cells and platelets count (p-value < 0.001 for all) in both types of anemia. Also a significant difference is noted between hemoglobin concentration and hematocrit percent to identify anemia in β-thalassemia trait (p-value 0.0236). Conclusions: Red blood cells count is mostly in the lower normal threshold or below in iron deficiency anemia, and it is in the upper normal threshold or above in β-thalassemia trait. Β-thalassemia trait usually presents with milder anemia or even with lower normal Hemoglobin concentration and hematochirt percent, while in iron deficiency the anemia is always clearly present. Relying on Hb concentration rather than on Hct percent to evaluate the presence of anemia makes its diagnosis more obvious. RDW higher than 24.3 % is only associated with iron deficiency anemia. Background: The primary purpose of transfusion medicine is to provide safe and effective blood and its components on need. New procedures to reduce unnecessary work load are vital to improve the efficiency of blood transfusion services, therefore, the introduction, reappraisal and rationalization of the surgical blood order schemes are important developments in this respect. Aim of the study: To audit the surgical blood ordering system adequacy in Al-Yarmouk Teaching Hospital in comparison to the defined Cross-matched: Transfused (C:T) ratio standards of the Maximum Surgical Blood Ordering Schedule (MSBOS). 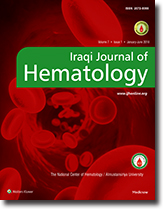 Methods: This study was conducted retrospectively in Al-Yarmouk Teaching Hospital blood transfusion center for the years 2008 and 2009 to evaluate the elective surgical blood ordering system in this hospital which is totally based on the surgeon's decision, i.e., patient-specific blood ordering schedule (PSBOS). All whole blood units cross matched and all whole blood units' transfusion for elective surgical procedures using the major cross match technique were included. Results: The amount of blood crossmatched (C) were 14780 units, the amount of blood transfused (T) were 11930 units , and the C:T blood ratio was 1.24:1.The sensitivity, specificity, positive predictive value and negative predictive value of the PSBOS are 98.9%, 75.8%, 80.7% and 98.6% respectively. Conclusions: The quite clear success of patient-specific blood ordering system (PSBOS) over the maximum surgical blood ordering schedule (MSBOS) in reducing work load in Al-Yarmouk Teaching Hospital blood transfusion center entitles the continuation with its application. However, this system needs to be periodically audited because its success may be at least partially explained by that the surgeons are underestimating the expected need for blood transfusion in elective procedures and that the transfusions were not all medically justifiable. Background: Dendritic cells (DCs) are bone marrow-derived cells of both lymphoid and myeloid stem cell origin that populate all lymphoid organs including the thymus, spleen, and lymph nodes, as well as nearly all no lymphoid tissues and organs. Although DCs are a moderately diverse set of cells, they all have potent antigen-presenting capacity for stimulating naive, memory, and effector T cells . DCs are receiving increasing scientific and clinical interest due to their key role in anti-cancer host responses and potential use as biological adjuvants in tumour vaccines, as well as their involvement in the immunobiology of tolerance and autoimmunity . Objectives: To generate the dendritic cells (DCs) in vitro from purified cord blood stems progenitor cells and detects the growth curve of cells and analyze the DC in vitro differentiation pathway. Also to investigate the immunophenotypic CD markers morphology of the surface DC cells and to describe the effect of different growth factors on their expression. Materials & Methods: For isolation and establishment in tissue culture of human DC, the cord blood was obtained from placenta of newly vaginaly delivered women, who were admitted in Al Kadhmyia Teaching Hospital. The cells were cultured in complete RPMI growth medium supplemented with growth factors GM-CSF+IL-4 for seven days then the key surface CD markers were detected by using the immunocytochemistry technique. Results: The use of the CD34 monoclonal antibody in combination with CD45 monoclonal antibody has increased the opportunity of obtaining a reasonable amount of purified stem cells. Furthermore, the growth factors (GM-CSF+IL-4) that were supplemented to the complete medium played an important role in the differentiation of the CD34+ stem cells toward the DC cells. The growth factors GM-CSF and IL-4 when used in combination had made the difference and the rhythm of differentiation ,the count of cells, resolution of results, shape and size of cells, and the state of DC cells better than using each of them alone. The IL-4 when used in combination with GM-CSF act as inhibitory factor for the granulocyte and cells other than DC and at the same time has the capability to keep the DC cells in immature state. The kinetics of DC development in cord blood cultures was also determined. These results indicated that, the optimal culture of the cord blood-derived DC was 7-9 days. By using the immunocytochemistry technique, the key CD markers of DC cells has been revealed since the day 6 of culture. The immature DC cells were characterised with the positive expression of CD1a, CD11b and CD11c while the CD14 was negative. Conclusion: Isolation, purification and mobilization of stem cells obtained were reliable and confirmatory, and indicate that the positive differentiation of the cord blood CD34+ stem cells toward the DC cells was achieved. Background: Therapeutic plasma exchange (TPE) is used to treat a variety of diseases, however, patient who needs such therapeutic regime can be already anemic and TPE itself may worsen the state of anemia by imposing red cell hemolysis and dilution. Objectives: To evaluate the effect of small volume TPE, type of replacement fluid, frequency of sessions and total volume of plasma exchanged on the level of Hb concentration and PCV %. Patients & Methods: This is a prospective study in which 50 patients underwent TPE at National Center for Blood Transfusion. A course of 3-12 TPE sessions performed at 1-11 days intervals; in each session about 1 liter of plasma was exchanged. Normal saline used as the replacement fluid for 25 patients and diluted FFP used for remainder. Results: Hb concentration and PCV % changed significantly after the first (P-value 0.003 and 0.03 respectively) and last (P-value 0.001 for both) TPE sessions using crystalloid replacement fluid. Also Hb concentration and PCV % changed significantly after the first (P-value 0.006 and <0.001 respectively) and last (P-value <0.001 for both) TPE sessions using diluted FFP fluid. The differences in Hb concentration and PCV % were not related to the type and total amount of replacement fluid, frequency and spacing between sessions. Also there was no relation between the frequency of complications and type of replacement fluid and amount of plasma exchanged per session except for perioral numbness and bleeding from site of puncture in which it was significant with p-value 0.01 and 0.001 respectively. Conclusions: Crystalloid solution can be used as the replacement fluid in small volume TPE especially in anemic patients. The amount of PE per session is a limiting factor for the development of TPE-related bleeding. Increasing the frequency of TPE sessions and reducing time spacing between them to increase the total amount of PE is safe. TPE-related citrate toxicity is reduced by using crystalloid replacement fluid.